You’ve probably heard the story of the Ugly Duckling, and it’s true – baby swans aren’t as cute as goslings or ducklings. They have gray or brown feathers until they’re about two years old, but they grow up to become the most beautiful of all water fowl. Adult swans usually have pure white feathers and a long, graceful neck. Adult swans usually have pure white feathers and a long, graceful neck. Swans are grumpy, especially when they’re protecting their eggs or babies. Swans mate for life and each mate is protective of the other. Swans even touch beaks to kiss. When they kiss, their necks form a heart. Swans form nests near the water’s edge made of mats of reeds and plants. Their eggs are about 4 inches long. When the babies, known as cygnets, are born, they can swim immediately. Swans even touch beaks to kiss. When they kiss, their necks form a heart. 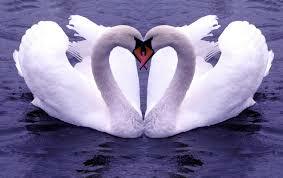 Isn’t that something cute all about swans? Swans are grumpy, especially when they’re protecting their eggs or babies. They attack other birds that enter their territory. They even attack dogs or kids that come too close. 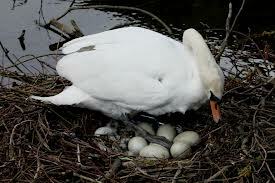 Swan eggs can take up to 42 days to hatch. 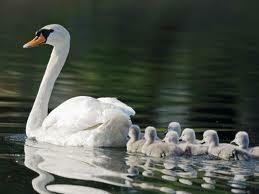 A female swan can lay between 3 and 9 eggs. After swans scare off other birds, they flap their wings and call to each other in celebration – sort of like a swan high-five! Swans live everywhere but Africa and Antarctica. Swans in Australia and South America are black or black and white. In England, the queen owns all mute swans. Every year the swans on the Thames River are rounded up. Their beaks are marked with the queen’s brand. 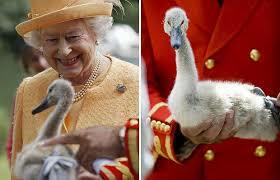 The queen sometimes gives swans as a special gift. A swan have in excess of 25,000 feathers. A swan can fly up to 60 mph. Avoid feeding swans bread, large amounts is not good for their digestive system. You can feed them lettuce, chopped grapes, bird seed, uncooked oats. Swans are related to Ducks and Geese. A swans beak is called a “bill”. Cygnets (baby swans) will stay with their parents until they are 3 or 4 years old. They then leave to find a mate. Swans form nests near the water’s edge made of mats of reeds and plants. Their eggs are about 4 inches long. In England, the queen owns all mute swans. A National Geography documentary of the tundra swan migration. Question: What are male swans called? Answer: Male swans are called cobs; females are known as pens. A group of swans are generally called a “flock”. In flight a group are also referred to as a “wedge”. Question: What do swans eat? Answer: Swans are herbivores. They dive for plants growing at the bottom of shallow lakes and ponds. Enjoyed the Easy Science for Kids Website all about Swans info? Take the FREE & fun all about Swans quiz and download FREE Swans worksheet for kids. For lengthy info click here. Declan, Tobin. " Fun Swan Facts for Kids ." Easy Science for Kids, Apr 2019. Web. 20 Apr 2019. < https://easyscienceforkids.com/all-about-swans/ >.